Though the 2012 DCI World Championships are now in the history books, Drum Corps International has great merchandise from our 40th anniversary summer season still in stock! 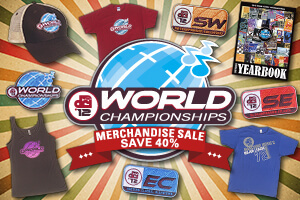 If you missed your opportunity to pick something up this August in Indianapolis or just want to get a hold of that perfect commemorative item for yourself or your favorite corps member, until Monday, Oct. 1 we're blowing out our stock of 2012 World Championship items at 40% off their original prices! From T-shirts to hats, patches, pins and more, sale prices are as marked, and no coupon code is required. While you're shopping, don't forget to pre-order your 2012 World Championship CDs, DVDs and Blu-rays which are scheduled to be released this November. This 40% off promotion runs for a limited time only. Order before Monday, Oct. 1 to take advantage of sale prices. Certain restrictions may apply. Shop all sale items today. Offers cannot be combined with other promotions or discounts. Promotion expires Monday, October 1, 2012 at 12 a.m. (ET) and excludes all 2012 audio/video products. Offers not valid on prior purchases. Drum Corps International reserves the right to modify or cancel promotion at any time.